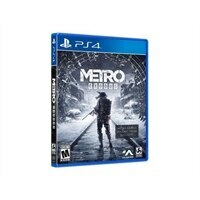 Metro Exodus - PS4Metro Exodus is an epic, story-driven first person shooter that blends deadly combat and stealth with exploration and survival horror in an immersive game world. Explore the Russian wilderness across vast, non-linear levels and follow a thrilling story-line that spans an entire year through spring, summer and autumn to the depths of nuclear winter. Metro Exodus is an epic, story-driven first person shooter that blends deadly combat and stealth with exploration and survival horror in an immersive game world. Explore the Russian wilderness across vast, non-linear levels and follow a thrilling story-line that spans an entire year through spring, summer and autumn to the depths of nuclear winter.